Our 220 kV XLPE insulated power cable series has a wide range of applications in the electric power engineering, medium and large-sized industrial enterprises, municipal construction and infrastructure. Such products are manufactured with the double-channel, triple extrusion, vertical, all-dry and crosslinking process. They have excellent performance and in particular, such indicators as eccentricity and magnitude of partial discharge are better than those specified in the national and IEC standards. Structured as a stereoscopic network, the crosslinked polyethylene (XLPE)-based insulators exhibit excellent electrical properties, good heat resistance and mechanical properties, easy cabling and erection, and protections from any impact due to the height differences. In particular, they can prevent oil leakage and any resulting fire hazards. Over ten years ago, the majority of 220 kV XLPE cables in China were imported. In the past ten years, the production technology of 220 KV XLPE cables has been available in China through the introduction of advanced technologies and raw materials from their countries of origin. The quality and technology of such products are up to the international advanced level, and they completely substitute for imported products of the same kind. 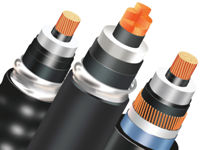 Intelligent optic power composite cables are produced according to the corporate standard.